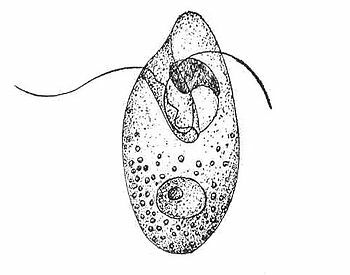 A dinokaryon is an eukaryotic nucleus present in dinoflagellates in which the chromosomes are fibrillar in appearance (i.e. with unmasked DNA fibrils) and are more or less continuously condensed. Nucleus with a dark nucleolus. The cell usually measures between 20 and 30 micrometers. The nuclear envelope does not break down during mitosis, which is thus termed closed mitosis. The mitotic spindle is extranuclear. ^ FENSOME R.A., TAYLOR F.J.R., NORRIS G., SARJEANT W.A.S., WHARTON D.I. & WILLIAMS G.L. 1993. A classification of living and fossil dinoflagellates. American Museum of Natural History, Micropaleontology, Special Publication 7: 1-351. This page was last modified on 9 January 2015, at 04:54.